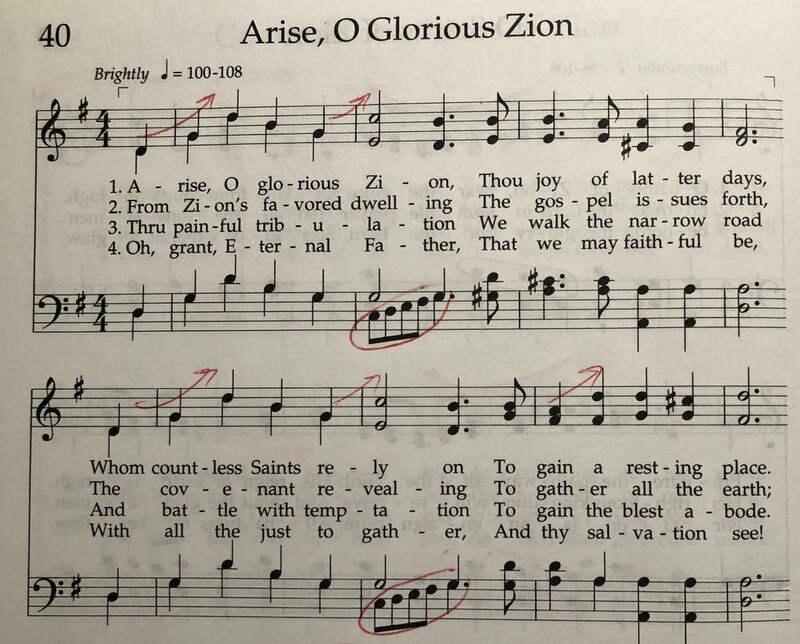 Hymn #40 -- "Arise, O Glorious Zion"
I don't ever remember singing this hymn in church. I think it gets eclipsed a little by Hymn #41, "Let Zion in Her Beauty Rise." 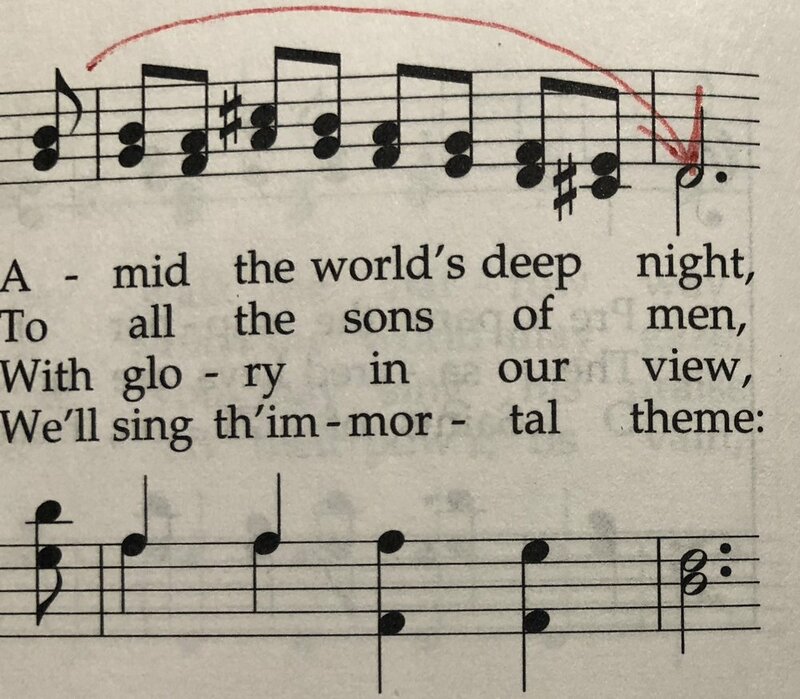 But Hymn #40 is a strong Zion hymn worthy of its place in the hymnal. The 1985 hymnbook committed replaced the original verses 2, 3 and 4 with verses 5, 7 and 8 to reflect the more universal definition of Zion instead of referring to it as only in the Intermountain West. I think this was a wise decision. The music takes many cues from the text. "Arise," "shine in splendor," and "amid the world's deep night" get particularly descriptive treatments. And for once, we get some exciting motion in the bassline to keep the old ward basses awake and engaged. Right off the bat the tun "arises" from low to high and keeps the trend going. The bassline follows right away with a 4-note run in the 2nd bar. The tune continues to build on "rising" motions and hit's its pinnacle at the start of line 3 with the high E. Then follows some circling motion to depict the shining splendor followed by a rapid descending scale "amid the world's deep night." 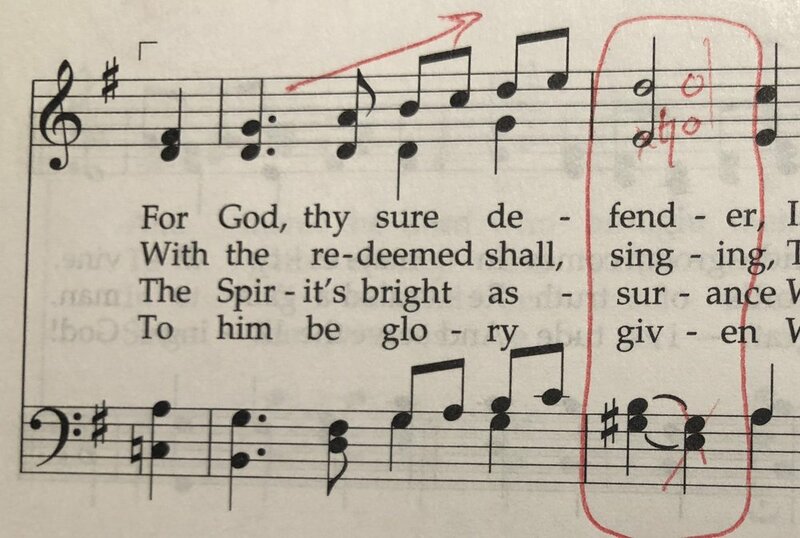 One last rise at the start of the 4th line demonstrates the power of the "sure defender" we find in God as it reaches the high E once again and lands on the high D.
I find the hymn engaging and exciting from start to finish. My only suggestion for improvement is to change the final E-major chord to something slightly different. Throughout, there is the addition of a G-sharp to create an E major chord when it should be E minor, based on the key signature. By the final line, I'm ready to hear a different harmonic use for the G-sharp than yet another E major chord. The easiest suggestion would be to turn the E major chord on the word "defender" into a G-sharp fully diminished 7th chord. To do this, all you'd have to do is change the alto note to an F-natural. This would re-color the G-sharp chord in its final appearance and on the climax note of the melody. It would make the hymn all the more interesting. Alas, no such luck. But it's a lovely hymn all the same. Very well done by George Careless. That's all for today. Tomorrow we'll discuss my favorite of the Zion hymns. P.S. If you'd like to see my complete harmonic analysis of Hymn #40, click the button below. These Zion hymns are generally all quite fantastic! They function very well as rousing opening hymns to energize a sleepy congregation and prepare them for the worship service and three hour block of meetings. This hymn fits into that mold very well. I think this rousing hymn is constructed in a manner that very well invites all to join in singing. I think it is a very good example of great hymn writing. Like others before it, this hymn works far better in two. I think it flows very well and creates a marvelous feeling of exuberance at around half note equals 58-60 (making the quarter note equal to 116-120). That kind of a tempo gives it nice excitement and energy. Like hymn #35, this hymn gives you an opportunity to work on that pedal technique. Unlike that hymn though, you aren’t presented with an octave-length scale, rather you have five-note scales. Slightly easier to negotiate. Gives an opportunity to work on heel-toe movement with one foot. It is also good technique to cross over when you are presented with a sharp or flat note. So the first five-note scale, you could pedal with two approaches. One is utilizing heel-toe technique thus: LT-LH-RH-RT-RH. Or you could cross your feet over like this: LT-LH-RT-LT-RH. This hymn yearns for principal chorus through mixture, with the inclusion this time of the higher mixture. Adding to the ensemble for the last verse is also highly recommended.